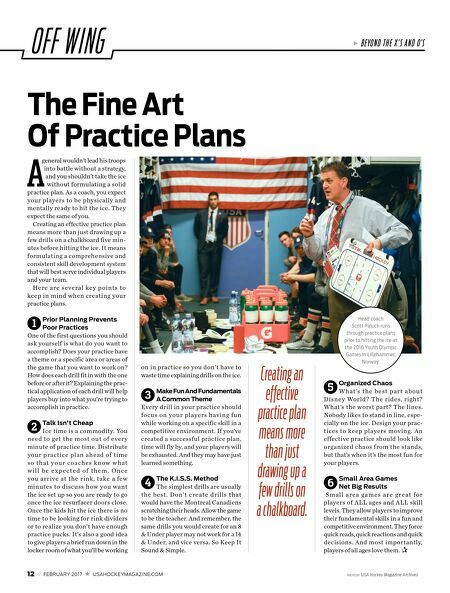 12 // FEBRUARY 2017 USAHOCKEYMAGAZINE.COM PHOTO BY USA Hockey Magazine Archives O F F W I N G The Fine Art Of Practice Plans Prior Planning Prevents Poor Practices One of the first questions you should ask yourself is what do you want to accomplish? Does your practice have a theme or a specific area or areas of the game that you want to work on? How does each drill fit in with the one before or after it? Explaining the prac- tical application of each drill will help players buy into what you're trying to accomplish in practice. Talk Isn't Cheap Ice time is a commodity. You need to g et the most out of every minute of practice time. Distribute your practice plan ahead of time s o t h a t y o u r c o a c h e s k n ow w h a t w i l l b e e x p e c t e d o f t h e m . O n c e you arrive at the rink, take a few minutes to discuss how you want the ice set up so you are ready to go once the ice resurfacer doors close. Once the kids hit the ice there is no time to be looking for rink dividers or to realize you don't have enough practice pucks. It's also a good idea to give players a brief run down in the locker room of what you'll be working on in practice so you don't have to waste time explaining drills on the ice. Make Fun And Fundamentals A Common Theme Every drill in your practice should focus on your players having fun while working on a specific skill in a competitive environment. If you've created a successful practice plan, time will fly by, and your players will be exhausted. And they may have just learned something. The K.I.S.S. Method The simplest drills are usually t h e b e st . D o n 't c r e a t e d r i l l s t h a t would have the Montreal Canadiens scratching their heads. Allow the game to be the teacher. And remember, the same drills you would create for an 8 & Under player may not work for a 14 & Under, and vice versa. So Keep It Sound & Simple. Organized Chaos W h a t 's t h e b e s t p a r t a b o u t D i s n e y Wo r l d ? T h e r i d e s, r i g h t ? What's the worst part? The lines. Nobody likes to stand in line, espe- cially on the ice. Design your prac- tices to keep players moving. An effective practice should look like organized chaos from the stands, but that's when it's the most fun for your players. Small Area Games Net Big Results S m a l l a r e a g a m e s a r e g r e a t f o r players of ALL ages and ALL skill levels. They allow players to improve their fundamental skills in a fun and competitive environment. They force quick reads, quick reactions and quick decisions. And most importantly, players of all ages love them. P Creating an effective practice plan means more than just drawing up a few drills on a chalkboard. general wouldn't lead his troops into battle without a strategy, and you shouldn't take the ice without formulating a solid practice plan. 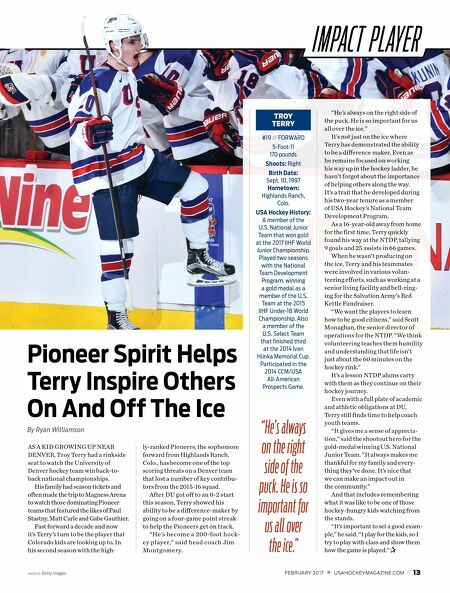 As a coach, you expect your players to be physically and mentally ready to hit the ice. They expect the same of you. Creating an effective practice plan means more than just drawing up a few drills on a chalkboard five min- utes before hitting the ice. It means formulating a comprehensive and consistent skill development system that will best serve individual players and your team. He r e a r e s e ve r a l ke y p o i n t s t o keep in mind when creating your practice plans. 1 2 3 4 5 6 3 B E Y O N D T H E X ' S A N D O ' S A Head coach Scott Paluch runs through practice plans prior to hitting the ice at the 2016 Youth Olympic Games in Lillehammer, Norway.